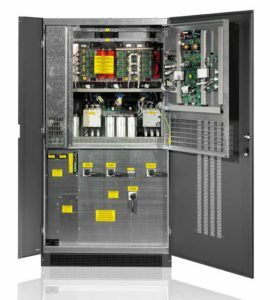 The Wave Master standard UPS is an on-line double conversion UPS (class VFI SS 111 in accordance with IEC EN 62040-3), with an output transformer insulation. Wave Master ensures the maximum protection and power quality to any type of load, also in critical environment and delicate applications such us: security, electro-medical, industrial processes, telecommunications. Reducing internal losses, correcting the power factor and eliminating the harmonics produced by loads the Wave Master UPS makes easier and more efficient to work with generators and MV/LV transformers. In addition, the progressive start-up of the rectifier allows to limit the input current absorbed and therefore doesn’t overload the source, especially when the source is a generator. The high overload capability is another advantage of this product. Wave Master UPS presents all the well-known features that allow the best battery performance and extend the battery life. Moreover Wave Master is compatible with all UPS battery technologies: vented open lead acid, VRLA AGM, Gel, NiCd. It requires a very small space for installation (only 0.64 sqm for a 200KVA system); at the same time the front access makes easier the maintenance and the components’ substitution. The upwards ventilation makes possible to place the rear side of UPS against the wall. a supervision and shut-down software for the most used operating systems. Wave Master can be adapted to meet your requirements. Contact Elettro to discuss the feasibility of specific solutions and options.